In June I spent a day in Merthyr Tydfil filming with Yellow Duck Productions for their hit BBC Wales genealogy programme, ‘Coming Home’. 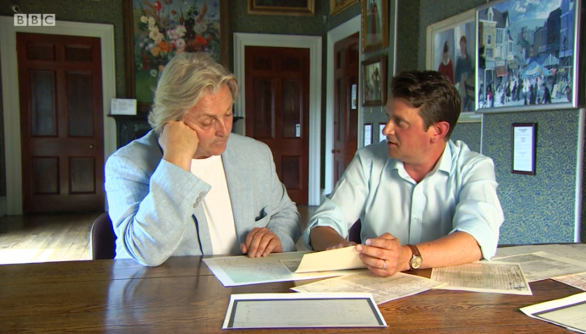 Having worked with Yellow Duck on a previous series I was asked to research the wartime service of John Leslie Emanuel, grandfather to the fashion designer David Emanuel. As was revealed in tonight’s broadcast, David never met grandfather who drowned in a tragic accident in December 1939. Whilst aware of his grandfather’s drowning, David had little knowledge of his wartime military service. We had a lucky start in that his grandfather’s service record survived. Using this and extant unit war diaries I was able to show David where his grandfather had served. 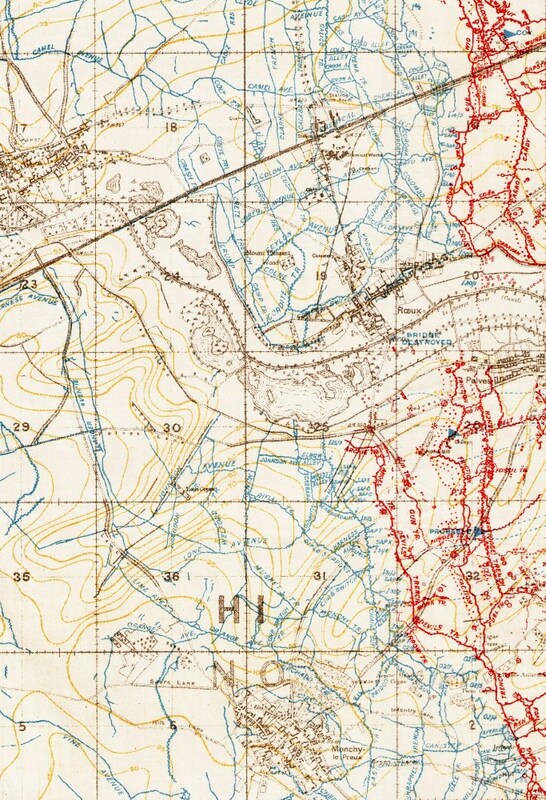 Trench map extract of the Roeux – Monchy area – positions occupied by 234 Machine Gun Company in summer 1917. Crump Trench runs just to the south of the railway line in the area west of the village of Roeux. John Leslie Emanuel enlisted in February 1916 in the Sussex Yeomanry and proceeded to France in September of that year, joining the 10th Battalion Queen’s (Royal West Surrey Regiment). He soon transferred to 124 Machine Gun Company, spending six months on the Western Front, mostly in positions facing the enemy on the Messines Ridge. His active service was interrupted by his evacuation back to Britain, suffering from P.U.O. (pyrexia of unknown origin). Four months later, having recovered, been promoted to Corporal and now serving with 234 Machine Gun Company, he again proceeded overseas. The unit war diary recorded the men swam in the sea off Le Havre (noting the water was warm!) before moving to the Arras sector. The Battle of Arras had ground to a bloody halt in mid May 1917 but isolated actions continued into the summer. The main British effort for summer 1917 was focused on endeavours in Flanders. However, this did not mean that 234 MGC had an easy time of it in Artois. Extract from 234 Machine Gun Company War Diary 18 August 1917. Held at National Archives, Kew under Ref: WO95/1472/2 and reproduced with their permission. The war diary is illustrative of the kind of routine and boredom of trench life but occasionally reveals periods of terror. 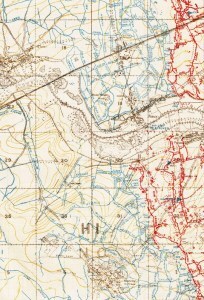 234 MGC was serving either side of the River Scarpe, providng support to the infantry occupying positions north of Monchy-le-Preux and in the village of Roeux, scene of bitter fighting in April and May. On 18 August an 8 inch German shell demolished a dug out near an anti-aircraft position in Crump Trench. Two of the occupants were killed outright but the machine gunners survived, despite being buried and badly shaken. 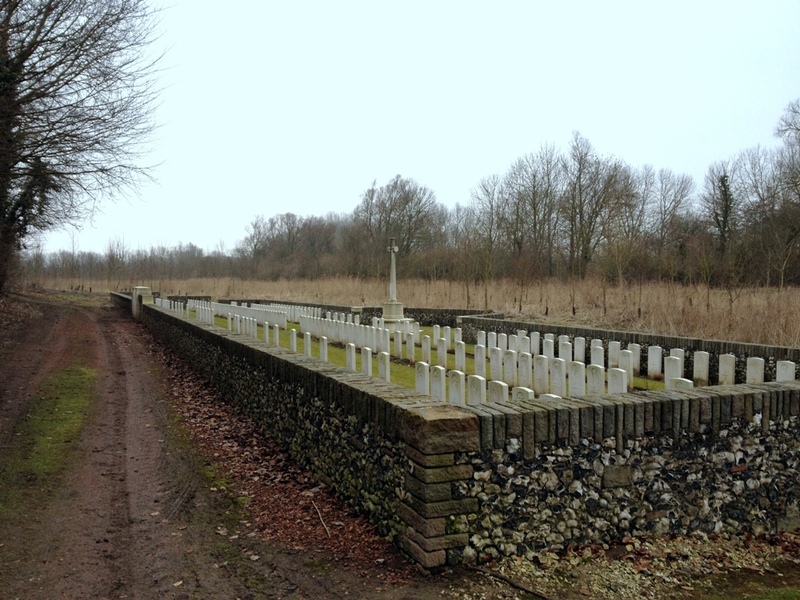 A CWGC cemetery, named after Crump Trench now sits on the trench location. Crump Trench British Cemetery. The A1 motorway to Paris runs just behind the cemetery. A month later the company moved up to Flanders to take their part in the British offensive – the Third Battle of Ypres (Passchendaele). What struck me when looking at David’s grandfather’s story is that he was sent to a Corps rest camp for the entire period 234 MGC was in action near Langemarck. It is possible this period of rest was astonishingly good luck on his part. However, with the unit having undergone a fortnight’s training prior to their deployment north, it seems a strange time for a Corporal to be given leave. Detailed records are missing but it may have been that, after the rigours of the Arras sector, he simply needed a break. Despite popular modern misconceptions there was an appreciation of mental fatigue and it was understood that often men needed a rest away from the guns to recover. Put simply, no man whose mind was in a fragile state would have been of any use in the artillery war that dominated the Flanders battles. This omission may well have saved his life as the company inevitably took casualties when engaged in battle. Upon leaving Flanders 234 MGC returned to the Arras sector. In mid-December 1917 John Leslie Emanuel was sent back to Britain as a candidate for a commission. He never saw active service again, being discharged before the armistice.